Which cereal to eat and why? Kashi different needs, different cereals are important! To paraphrase a classic, I want to talk about their everyday concerns: whether the cereal is really useful because (it always? ), What and how to eat and how to cook porridge? Everyone knows that the porridge (or rather - cereals) - a source of slow carbs, those that saturate a long time (without leaving a feeling of heaviness or discomfort in the stomach) and do not cause a sharp spike in blood sugar levels. But! Just want to make a reservation: matter how you cook the barley and what is it to use will depend on your slow carbohydrate cereal or fast. 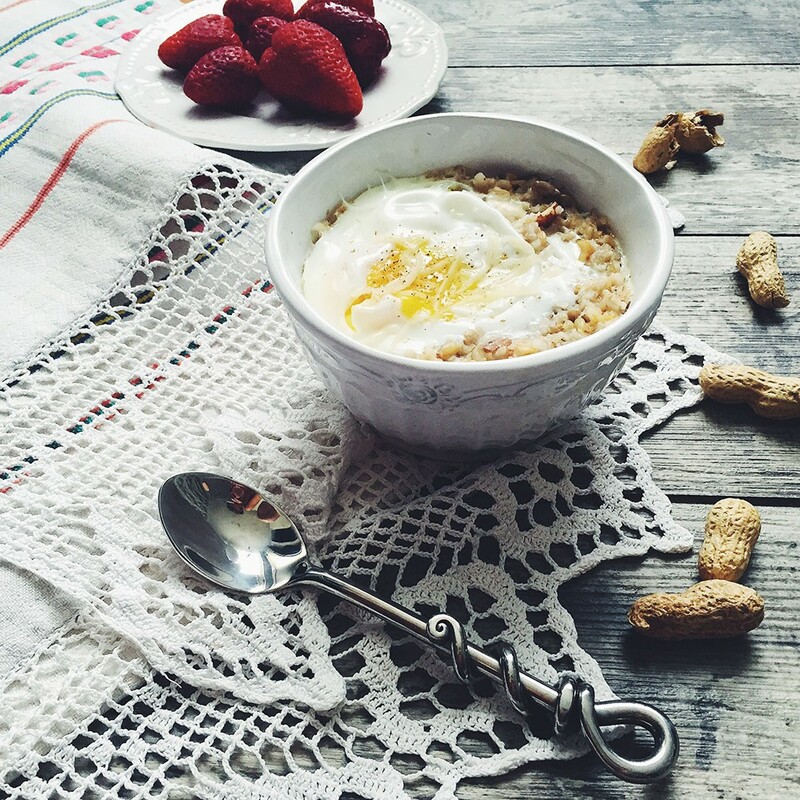 For example, if you love to eat porridge with butter (or other sources of animal fats:. Milk / cream, cheese, etc. ), keep in mind that this total glycemic index product increases. Of course, it's not criminal, if you know the measure and use of cereals from whole grains (not fast food flakes and without having high glycemic index). If added to the porridge a little vegetable oil or, say, natural peanut butter (The word "right" vegetable fats - unsaturated), The total glycemic index of a product can be a little lower. Probably everyone knows, and that the content of dietary fiber in the diet also lowers the overall glycemic index. Therefore, for example, add oatmeal (or other viscous) porridge spoonful of oat bran would be very appropriate. In addition, the bran will absorb excess moisture, and porridge from this will only tastes better. At the same time expose the bran, in this case heat treatment should not add them to a warm finished product and let 5-10 minutes. Also, almost any mess would be superfluous to add a spoonful of ground flax seed (in other words, flax flourThat is rich in protein and vegetable, and valuable unsaturated fats and fiber - 3 1 in). I add ground flax seeds in oatmeal, barley, corn. To learn how to cook porridge need to also say a few words. Excessive cooking of any grain increases their glycemic index, so do not digest cereal. The ideal add-2 2,5 1 portion of water on a portion of cereals. How long should I cook porridge? Here, of course, everything depends on the cereal. As a rule, 10-15 minutes cooked buckwheat, barley, corn, millet and wheat porridge. Brown rice I cook about 20 minutes, a bit longer brewed barley and oats (30 minutes) - which, incidentally, the best pre-soak in cold water for several hours. Let me tell you as one of the "secrets" cooking cereals dolgorazvarivayuschihsya: soaking them, add a few drops of lemon juice in the water (it softens the grain), then rinse and cook as usual. Turn off the rump, almost Dowar leave a little liquid in the pan for a minute 10 it "comes". Cook porridge on the water or milk - of course, up to you. Single opinion is not here. It is for certain one is known - cooked porridge on milk has a higher caloric value and again the glycemic index. So, if you want to lose weight, I suggest cooking porridge still on the water. Раньше я любила молочные каши (да пожирнее:), сейчас совершенно искренне могу сказать: больше нравятся каши на воде и из цельного зерна (т.е. не хлопья). Кстати, к вопросу о том, сколько нужно брать крупы (взвешивать ее нужно, конечно, в сухом виде перед варкой). Если вы ведете неактивный размеренный образ жизни (скорее сидячий), то достаточно будет XNUMX-XNUMX грамм крупы в сухом виде. Не нужно думать, что это очень мало: сварившись, крупа увеличится в объеме, как минимум, в XNUMX раза (а то и больше). Если ваш образ жизни активный, подвижный, то ориентируйтесь по своему аппетиту. Kashi - it is not boring and primitive! To learn how porridge need to submit it to be a truly delicious (and, of course, it is useful), I'll tell you below. Как правило, в готовую кашу я добавляю немного необжаренных орехов или семечек (не больше XNUMX-XNUMX г), иногда — XNUMX чайную ложку молотых семян льна/льняной муки, иногда – чуть-чуть растительного масла (оливкового, горчичного или из тыквенных семечек). В сезон ягод могу добавить горсть черники, голубики, малины и пр. А иногда (под настроение:) — немного сухофруктов. Сладкие каши я никогда не варю (более того, даже не люблю добавлять мед/варенье в каши), поэтому каша со сладким «наполнителем» на моем столе, скорее, редкость. Sometimes, you want butter flavor - then add a little butter. Sometimes you want something spicy - then add in porridge (oatmeal is especially true for and pearl barley) a little grated parmesan. By the way, if we are talking about cheese, it also can not share: a crazy taste is obtained by adding to a pulp just a little bit of soft blue cheese (prerequisite - it should melt in the porridge! ), Though perhaps such "zest" for everybody. I also like to add some types of cereals (barley, barley, brown rice) bit pesto: Tasty, helpful, bright! Sometimes I mix several types of cereals when the cook porridge morning. For example, the perfect combination for me are the barley-corn porridge (due to a low GI cereal barley averaged overall GI), rice, millet (I use brown rice), buckwheat, rye. By the way, the last perfect complements Chicken liver soufflé. Cereal can be mixed in any ratio (50: 50 optimally or to your taste). As a child I loved to be added to the porridge jam: strawberry, plum, apricot, black currant. Now passion for sweets (in this form) I have lost, and reminds himself rarely :) If you want spicy and sweet porridge, then you definitely have to taste oatmeal, baked apples in the oven. By the way about his childhood: porridge in my children's diet was much less (oat flakes, rice, semolina and less millet). Yes, I would say a few words about the ladle. Her I do not cook. And not because it is "tasteless and lumpy." And because "empty" - is essentially free of cellulose and 2 / 3 consists of starch, therefore, it is quick and carbohydrate use therein, as compared to other cereals, small.